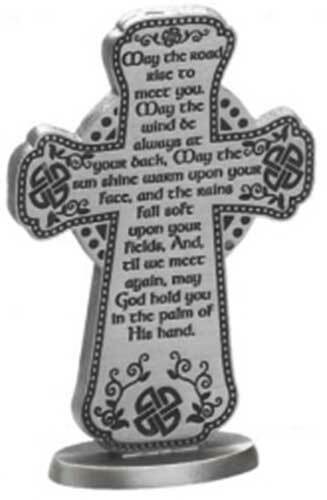 Standing Celtic cross is a pewter design that is enhanced with The Irish Blessing along with knot-work. This standing Celtic cross features pewter construction that is enhanced with an Irish blessing along with embossed Celtic knot-work. The pewter Celtic cross stands 3” tall. This Irish figurine is gift boxed with Celtic knot and Celtic cross history cards, complements of The Irish Gift House.